Newton’s Cradle is a classic science project demonstrating momentum. 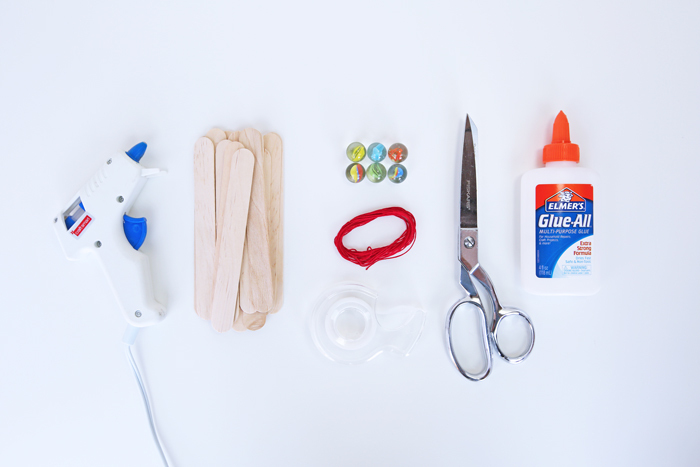 It also doubles as a fun DIY science toy for kids and adults! And psst… it’s perfect for the science fair! I have special connection to this project because it was my own entry into the science fair many years ago. 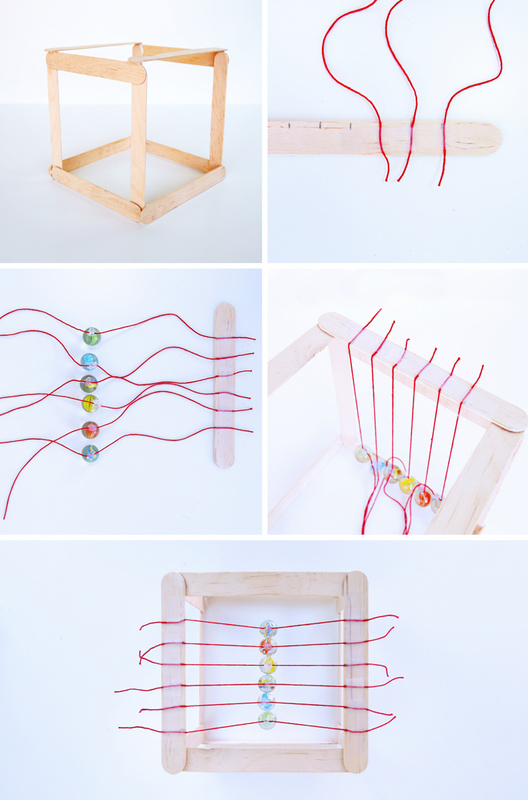 The version I built used actual ball bearings (the benefit of having a grandfather who was an inventor with a machine shop) but you can learn how to build a simple Newton’s Cradle at home using materials from the craft store, right here, right now. As I developed this project for my book STEAM Play & Learn and tried to come up with the simplest version ever, I experimented with a lot of materials for the spheres. I tried wood beads and GIANT plastic beads and here’s what I discovered, none of them worked…why? Well the answer is in the science behind this project. MASS is critical to momentum. Learn more about it in the Let’s Talk STEAM section here. Safety: Marbles are a choking hazard. Please supervise this activity with any child who puts things into their mouth. NOTE: You must use marbles for this project to work. Wood beads are not dense enough to transmit energy through them. Step 1 Glue (4) craft sticks together at the corners to make a square. Repeat with (4) more crafts sticks. Let dry. These will be the sides of the frame. Step 3 Hot glue a marble to the center of one of the pieces of string. 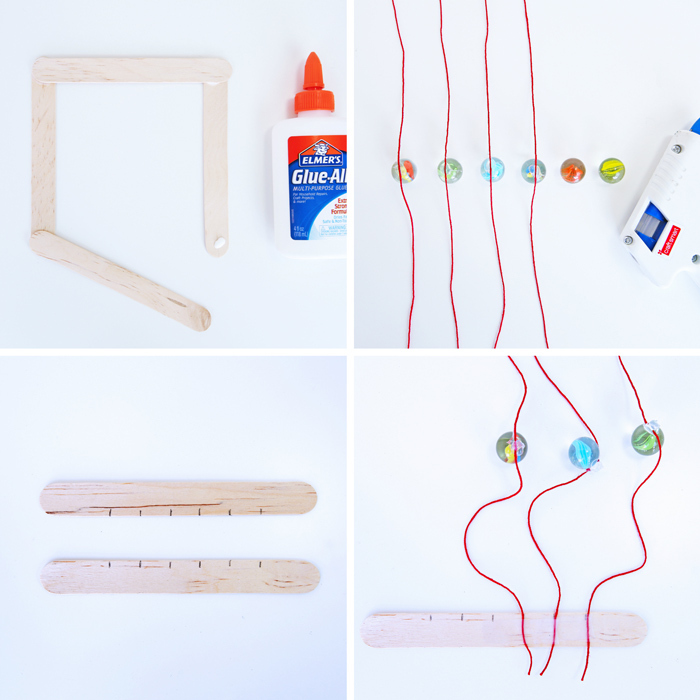 Repeat to end up with (6) separate marbles, each glued to the center of a string. Step 4 Make (6) marks along two craft sticks every ½”. Make sure the marks are centered on the sticks. Step 5 Tape one end of the strings with marbles attached along one of the craft sticks at each mark. Set aside. Step 6 Using hot glue, assemble the frame. Take the two sides and hot glue a craft stick perpendicular to each corner. The final frame will be a cube. Step 7 Glue the craft stick with the taped string/marbles to one side of the frame. Step 8 Glue the second marked craft stick to the opposite side of the frame. Step 9 Tape the loose end of each string with a marble attached to the marked craft stick. Pull on the strings gently to make sure the mables align. The marbles must line up both horizontally and when viewed from the top. Pull one of the end marbles up and let go! Watch what happens! Newton’s Cradle is a toy named after the very famous scientist, Sir Isaac Newton. It demonstrates a scientific idea called momentum. Momentum is the force of an object as it moves. When you swing one of the marbles on the end, it collides with the marble next to it and the force of that collision travels through each of the other marbles until it reaches the last one, which swings upward. When that marble swings back down, the force travels through the marbles again. Read more about momentum and collisions here. This is a demonstration of a scientific principle called the conservation of momentum. This principle states that when two objects collide their momentum before the collision equals their momentum after the collision. In Newton’s Cradle the force of the collision travels through each of the balls until it reaches the last ball which swings up. Density is a measure of the amount of mass per unit of volume of an object. Denser objects have more mass. The more mass an object has, the stronger the force of momentum will be when it swings. 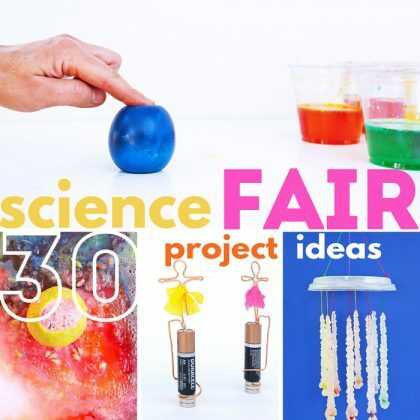 You can test this out yourself as part of a science fair project! See our How to Turn this into a Science Fair Project section below. This DIY toy is supported by a rigid frame. A frame is a structure that holds something tightly in place. This toy has a lot of movement in the marbles and will not work if the frame around the marbles also moves. Newton’s Cradle also demonstrates a concept called tolerances. In engineering, products must be built very precisely. If they aren’t, the product will fall apart when in use. 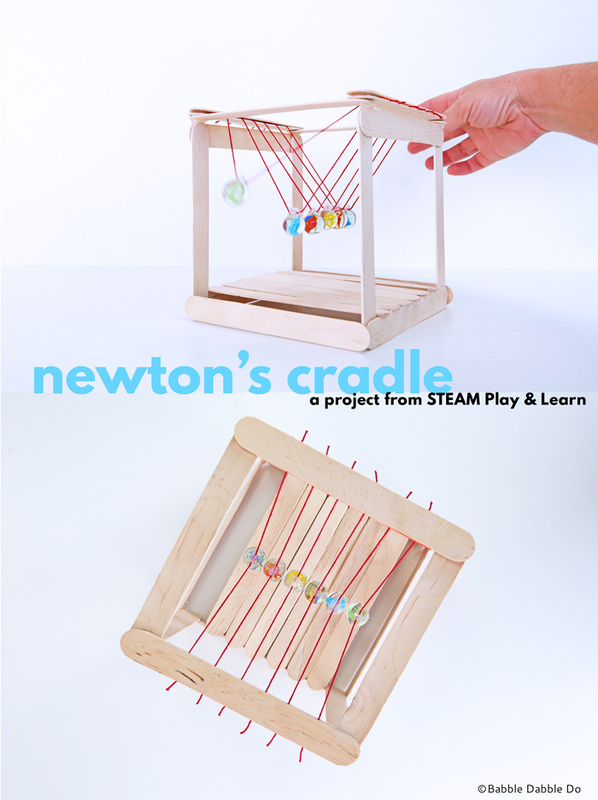 In Newton’s Cradle the marbles must be hung very carefully side by side and in a line or the toy won’t work. Have fun playing with this! Try lifting and releasing two marbles at a time. What happens? Color the craft sticks first and learn about capillary action! If you soak craft sticks in water colored with food coloring, the color will travel up through the wood as the water is absorbed. You can learn how to do that here. 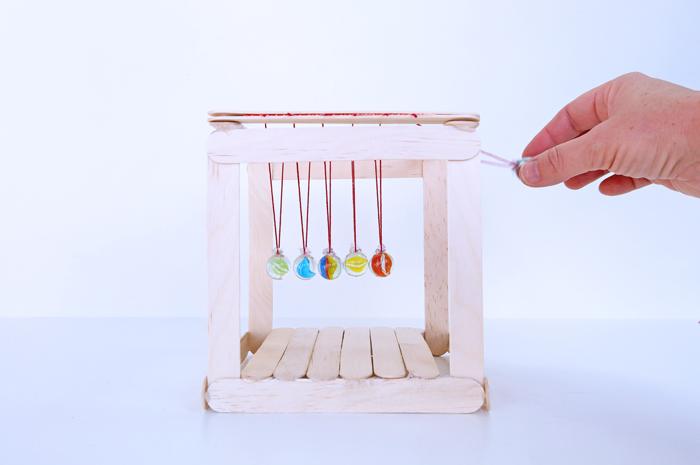 Let dry and then construct a tie-dyed Newton’s Cradle. Ask yourself questions There are a lot of interesting things going on in this project that you can investigate. Some question ideas: What sphere materials make for the best demonstration of momentum (marbles, ball bearings, wood beads, gumballs)? Can you give the wood beads more mass to make them work in this demonstration? How? How rigid does the frame need to be for the project to work? Does the number of spheres have an effect on the way this works? What happen if you have more spheres in the line? What happens if you have fewer? Research Do research online and at the library to try and predict the answer to your question. For instance, read about momentum, mass, and density. Try to predict what materials would make the ideal Newton’s Cradle model. Experiment! Test your hypothesis by testing the variables and documenting them. Be sure to take notes of each experiment and what happens; this is called your data. Experiment with sphere materials Try using large wood beads and if possible ball bearings. How do the different materials change the way the model works? Experiment with mass Try using one material for the spheres and adding mass to see if it affects the action. Can you add something dense to the underside of the spheres and change the momentum? Experiment with number of spheres Will the model work if there are 10 spheres? How about 2? What is the ideal number of spheres to use to get the most consistent reaction? Experiment with how high you lift the marbles What happens if you barely lift the marbles and drop them? How does that change the momentum? If you’d like to see more projects from my book hop over here. 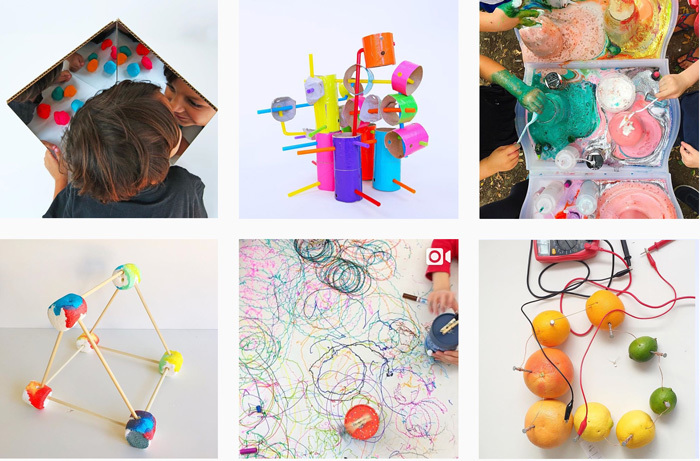 You can also follow along on Instagram using the #steamplayandlearn. 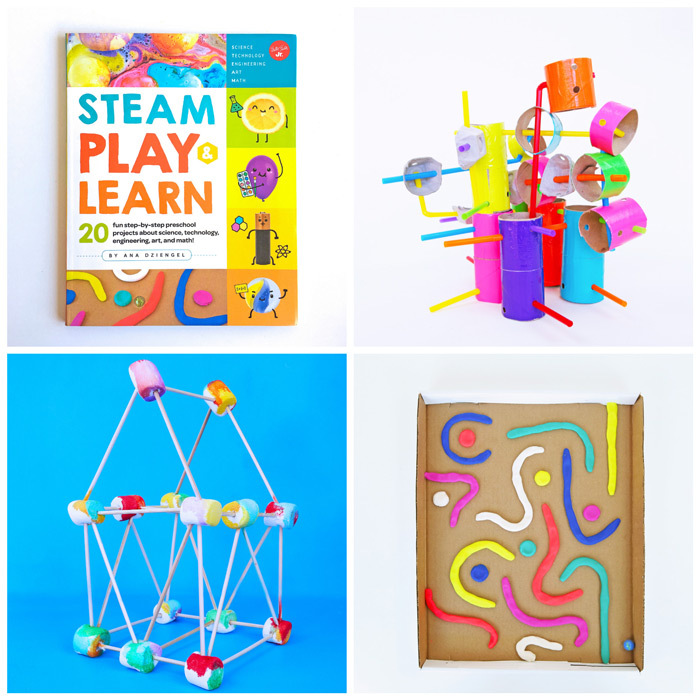 If you try any posts from the book be sure to tag them #steamplayandlearn!